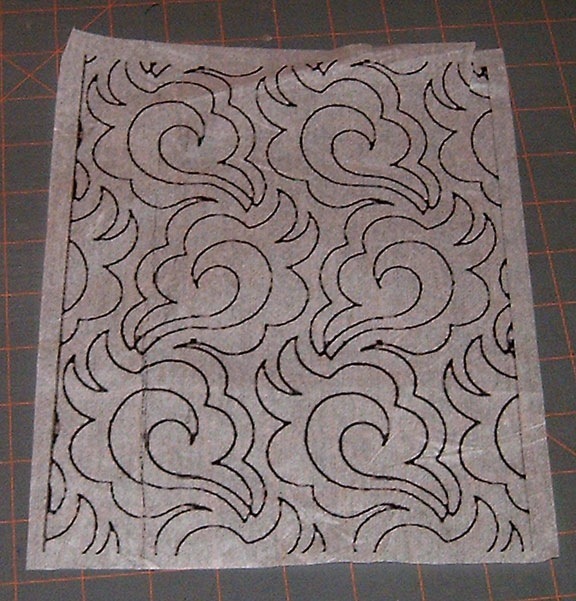 So today, I start by printing out on tissue paper the quilting motif I wanted to use for this quilt – went pretty good, the paper folded a bit on the way the way thru, but I wasn’t going to toss it for that .. 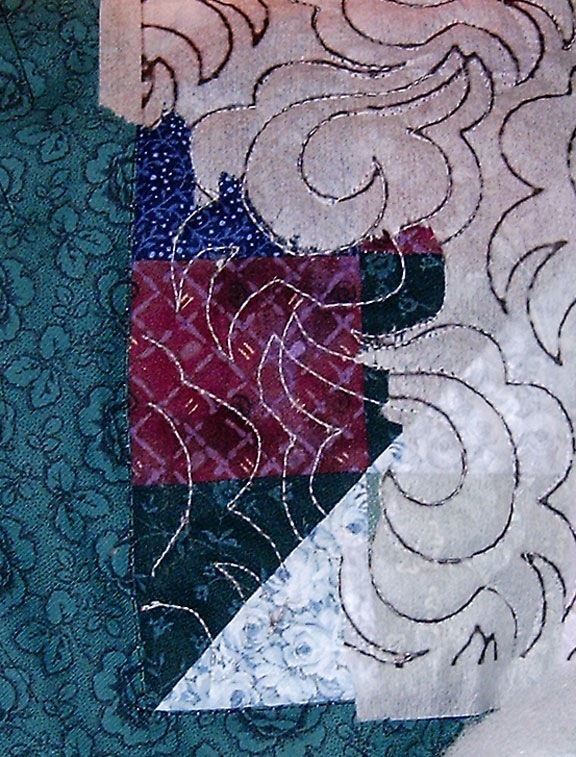 So with a few dabs of my glue stitch I attached it to the quilt and load it up on my machine .. Checking my work after I got that first section down … not to shabby at all me thinks! I would have preferred to use a green thread for this, but damned if I could find one!! And I ripped a few places apart (no I didn’t check my closet – I prolly should have tho :() and no dark green thread that i was looking for … (altho I did find the blue I was thinking of using for my case 128 fan quilt ;)) I find the tissue came off fairly easily – I used the back of me seam ripper to weaken the paper a bit more since I was using a longer stitch. You can see in a few ‘points’ where there’s some paper (I also went a wee bit cross-eyed picking the paper out) I didn’t quite get right to the edge while starting this and I will extend the spots I miss later – that will come with time and practice using this method. I went really cross-eyed here picking at the paper after I had done about 2 rows / columns in the design. I wanted to see a more overall look than the itty bit that I had pulled off earlier .. again the back of my seam ripper to weaken the paper, or using the flat of my seam ripper to lift the paper and it came right out! Oh for variety you can also scratch the paper away with your nail ;). There’s a few bits n pieces still in there, but I was going cross-eyed at that time and I’m really hoping that what I miss paper-wise, the washer will take care of .. 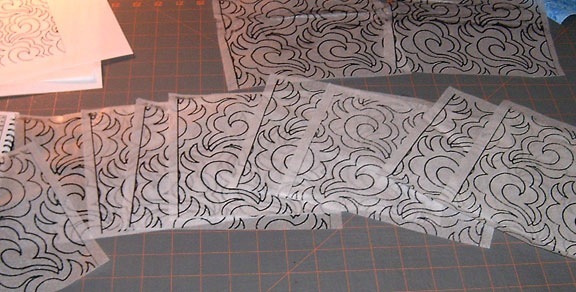 Repeating patterns can create a stack of paper you didn’t really want .. I need to do more than just see the repeat, I need to print just the ONE pattern out – else it does create many lips of paper that you have to watch for and more to pick out of the stitches later – less is better in this case .. So after checking the first column I got busy and printed out what I hope will be enough tissue for the rest of this quilt .. if not, i can print out some more .. what I do want to do is maybe skinny out the lines on this or even use 20% black for the ink instead of 100% .. it doesn’t really need to be that dark or big. 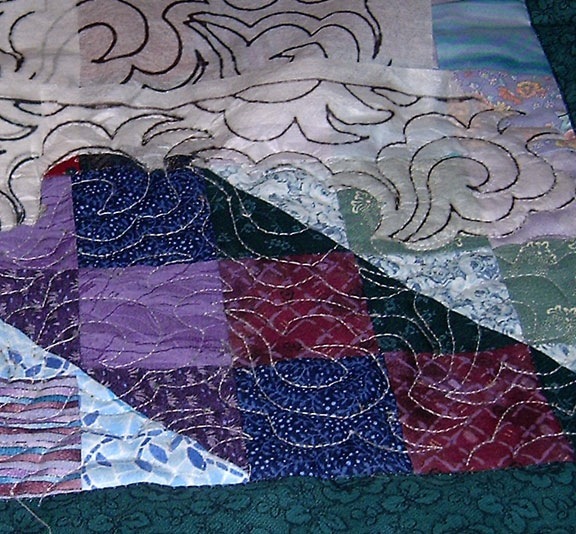 I wanted to have this done today (and I still might), but watching a movie and a repeat of a weekly show I watch but missed last week over rode my quilting time .. I’m almost done the 2nd column – since i have the hang of this it shouldn’t be all that much longer – and tomorrow will be a busy day with the tier championship happening. watch your repeats in the pattern!!! I hope that everyone who wants to try a technique does – even if it doesn’t go as planned, you will find ways to make it work – and always you will learn from it. Hope you find my experiment helpful – Have fun with it! You go girl. That looks like a whole lot work. More power to ya. LOL. I can’t wait to see it all finished. Knowing you it will be done lickity split. If you can stand to wait until the quilt is off-machine, you can give it a tug diagonally and every which way and that will release a lot of the paper. Alternately (because I know you’re sooooo patient), use a pointy stick, like a sharpened chopstick or a manicure stick, in one hand to score along the stitching and generally poke/pull the big pieces of fabric off. The you can wield the mighty SERGER TWEEZERS to get the smaller pieces. Scratching it with your fingernail will also encourage the paper to hop off the quilt. The whole thing makes a mighty mess, but it’s worth it. Anyway, it’s a good no-brainer activity. If you have the chance to find some of the tissue/thin paper that’s used on manucurists’ tables (I got mine at a beauty supply house), you might be able to print larger pieces so there’s less waste, yadda yadda. 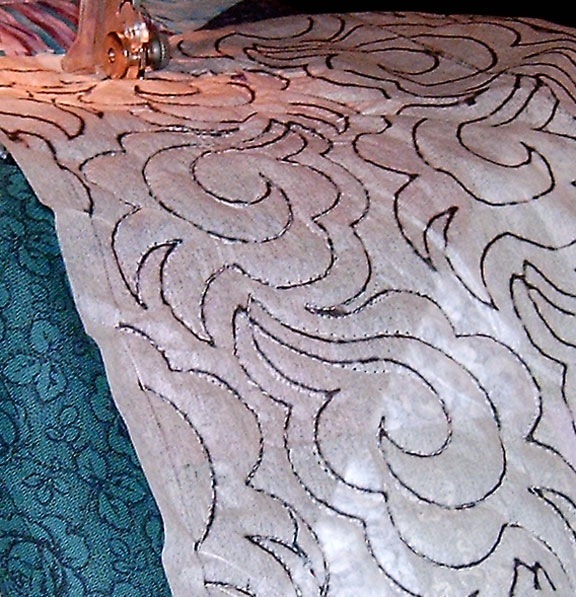 When it comes to machine quilting, my manicure stick and table paper are indispensible in my house! Wow, it’s fabulous. I can only wish at this point to have some great free motion skills. I need a lot of practice. I have never seen the gold paper at Joann’s but the one close to me is really small. I got some at a quilt show. I’m not really understanding how you managed to put it through the printer. I tried the stitching through a stack but found it very difficult to see. Thanks for being a guest blogger. Your quilting looks so good, and the thing I also am not sure of is how you printed on that paper.